French Jewish leaders distance themselves from controversial group, but also question why violent pro-Palestinian groups do not face a ban. 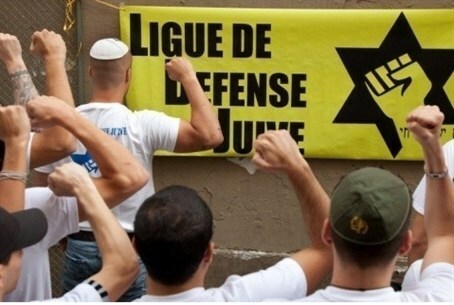 French Jewish leaders have reacted to the possible ban of the Ligue de Defense Juive (LDJ), a militant Jewish group involved in recent clashes with pro-Palestinian activists during rallies against the Gaza offensive which turned violent. The CRIF's head Roger Cukierman distanced his group from the LDJ as news of the possible ban emerged, saying: "We share neither their ideology nor their methods." "It's a tiny organization comprising a few dozen members from what I know," he said, but expressed surprise that the government was not planning to ban "pro-Palestinian groups which have tried to vandalize eight synagogues in the Paris region." The main Jewish students' union echoed that view. Its head Sacha Reingewirtz said: "I condemn all forms of extremism... but if the government disbands it (the LDJ), it should also ban all the radical groups behind recent anti-Semitic violence." Far-right leader Marine Le Pen meanwhile blasted the ruling Socialists for failing to stem "riots in the heart of Paris" after having banned demonstrations. "We must protect the right to demonstrate but from the moment that the state takes a decision to ban a rally they must provide the powers so that the ban is respected," said the head of National Front party. News of the mooted ban came as France's main Jewish group prepared to stage a pro-Israel gathering in Paris, in response to weeks of protests marred by clashes, arrests and anti-Semitism. Synagogues and Jewish-owned shops have been attacked by Muslim and left-wing extremists in Paris, prompting bans on protests as authorities have struggled to get to grips with the anti-Semitic surge. In one particularly severe incident, a mob of Muslim rioters attempted to storm a synagogue in an attack likened to "Kristallnacht" by one French Jewish community leader. Witnesses said that the LDJ's Jewish youths mobilized to fight back after police took a long time to arrive.